Our custom Outreach Group Travel plan is one of our favorite international traveler plan for those taking short term teams, individuals vacationing or even expats who will be overseas for over 12 months at a time. We recommend this international medical insurance plan for those on Medicare because it is a great cost-effective investment since Medicare does not cover overseas. Also, this travel plan, like all short term travel plans, have limited to no pre-existing medical cover. All short term travel plans are to cover for new medical conditions while you are overseas. 1. You can see full details, get quotes, and apply online at: www.gninsurance.com/outreach-group-travel-short-term-team-insurance. 2. This plan automatically includes up to $500,000 for medical evacuation. 3. Coverage on pre-existing medical conditions is limited to $2500 for sudden and unexpected recurrence for those over the age of 65. 4. Medical coverage would be for everywhere outside the U.S.
5. Canadians may use this international short term team travel insurance plan for coverage outside the U.S. and Canada. 6. Deductible options of $0, $100, or $250. 7. Option to include trip cancellation cover. 8. You may have just one person on this policy or a whole group of folks on the same policy. 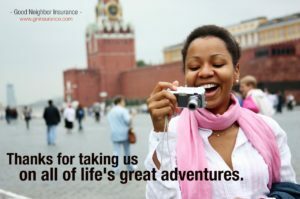 Go online to https://www.gninsurance.com/outreach-group-travel-short-term-team-insurance/ to purchase your travel plan or call our agents at 866-636-9100 /email address is info@gninsurance.com.